We have pursued laparoscopic hepatectomy as a means of surgical therapy for hepatocellular carcinoma (HCC) since 1993. It has been reported that laparoscopic hepatectomy in the patient with HCC appears to be a viable surgical alternative providing less invasion in selected cases. This procedure is expected to develop further in the future as a new surgical method for HCC. However, HCC is associated with a high frequency of intrahepatic metastasis and multicentric occurrence accompanied by underlying chronic liver disease caused by HBV or HCV. Repeat hepatectomy for recurrent HCC has good survival benefits, but its indication is restrict on the poor hepatic functional reserve and/or unresectable tumor dissemination in the remnant liver at the diagnosis of recurrence. Here, we present two cases of repeated LH for recurrent HCC. Case 1. 65-years-old male who had underwent pure laparoscopic partial hepatectomy for extra-hepatic growth tumor in diameter 4cm in segment 3. Repeated pure laparoscopic partial hepatectomy was performed to recurrent HCC in diameter 2.5cm in segment 3 5 years later. Caes 2. 79-years old male who had underwent laparo-assisted left lateral sectionectomy for Giant (14cm) HCC performed in 2005 and laparo-assisted Segment 4 subsegmentectomy for recurrence HCC of this case 3 years later performed in 2008. In the postoperative course, oral intake and ambulation were day1 in both 2 cases. Hospital stay values were within 7 days without any postoperative complication. Both 2 cases survive well with no recurrence. Laparoscopic hepatectomy is beneficial for the patients’ quality of life as a minimally invasive. 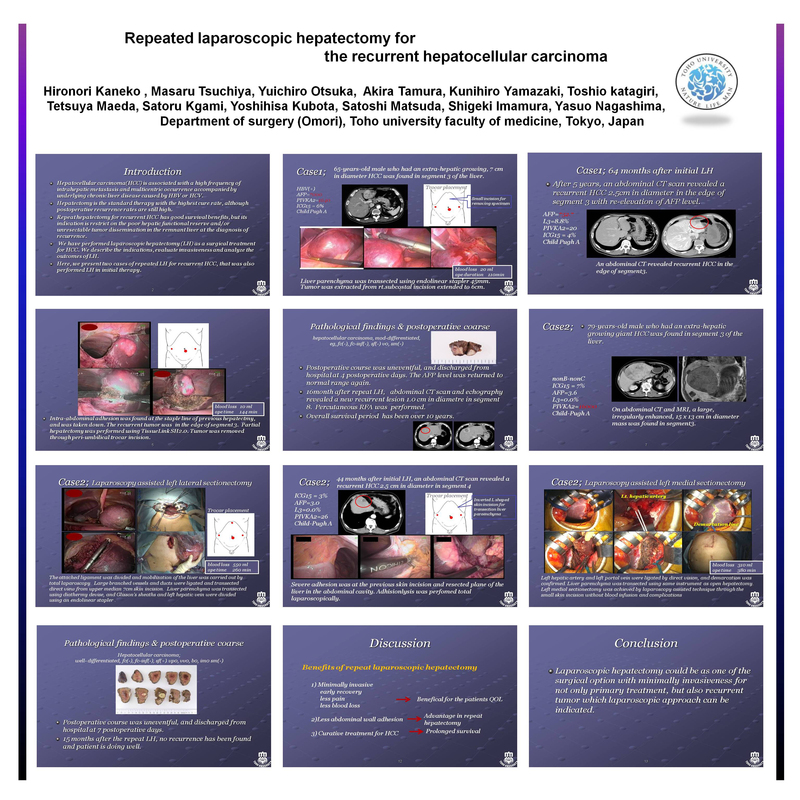 Laparoscopic hepatecotmy is expected to develop further in the future as a new surgical method even for recurrent HCC.